New Years always sneaks up on us! With all the Christmas hype, I tend to not even think about New Years until like the day before! 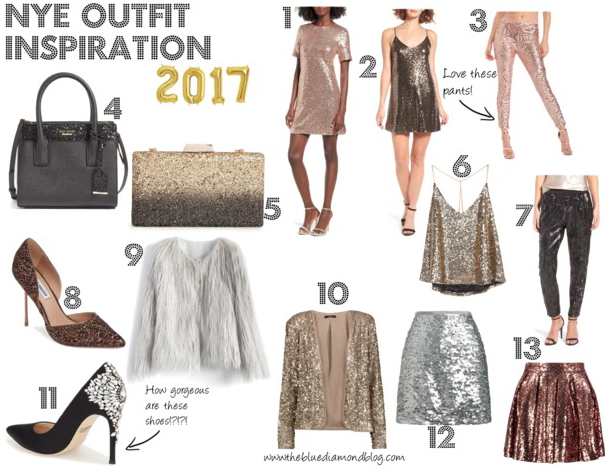 This year I am staying ahead of the game and sharing some NYE outfit inspo! Enjoy! I like how this feels simple because of the T-shirt shape, but the sequins dress it up! This would be super cute with a leather moto jacket! How cute are thees!? Love the rose gold!! This satchel is precious! I love the glitter detail! Love a good statement clutch! This top would be so cute with some faux leather leggings! Obsessed with these shoes! So so so cute! I'm all about the faux fur! This would be cute over a sequin dress. Want this blazer so bad!! Obsessed with this skirt! Its on sale, too! I really like the copper color!